How Can Inflation Be Reduced? Inflation is a persistent rise in average price level over a year, it is measured through CPI (Consumer Price Index). CPI takes a basket of goods ,which are weighted due to expenditure in a household budget (so you spend more money on food then shoes therefore food has a higher weight). CPI then looks at how the prices have changed and dictates a rate in accordance to the statistics. Inflation usually carries negative connotations as it usually comes in conjunction with economic instability therefore many different methods have been devised in order to avert the problems of inflation and reduce it. An example of high inflation which was reduced is in Britain. In the 1970's inflation was phenomenal and peaked at over 20%, through successful monetary policy however this was mitigated. By raising interest rates it reduces the growth of aggregate demand it encourages saving (which would stifle consumer spending and investment) as well as reducing disposable income. Monetary policy is a proven technique used to reduce inflation. Favoured by the US and UK it looks at the modification of interest rates in order to control inflation (and reduce) this is know as tightening monetary policy. Monetary policy is the control of money supply by the central bank (so in Britain it is the Bank of England and in the US it's the Federal Reserve). 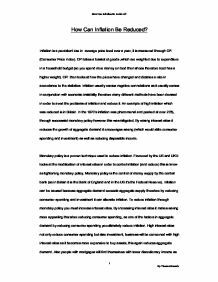 Inflation can be caused because aggregate demand exceeds aggregate supply therefore by reducing consumer spending and investment it can alleviate inflation. To reduce inflation through monetary policy you must increase interest rates. ...read more. That is why classical economists argue trade union power should be cut because by doing this you can stimulate supply and help combat inflation. Although the counter argument to this is smaller hours and better pay can actually help production as it creates a happier worker who is less fatigued and happier to work. Also trade unions are a more organised way of voicing concerns, if it were left solely to the worker it could cause chaos. Classical economists also argue that state welfare or unemployment benefits should be reduced. Why would a worker take a low paid job when the government are handing out the same pay in return for doing nothing? The average worker is not going to accept a low paid monotonous job when they could receive the same money for not working. As benefits are too high it means less is being produced as there are less workers (and the labour force makes up a substantial amount of aggregate supply). The classical economists argues that governments should make benefits less appealing by slashing them and give more incentive to have a "low paid" job (I.e. Give more state support to those who maintain a poorly paid job). Another way to stimulate aggregate supply in labour would be to reduce taxes on labour, if corporations did have to spend as much money paying taxes for hiring workers then they would be more inclined to raise employment. Another way to increase aggregate supply (in an attempt to mitigate inflation) is through increasing capital stock. Capital stock is factories, offices and roads basically anything physical that can be controlled through the state. ...read more. so this could in itself actually cause demand pull inflation. 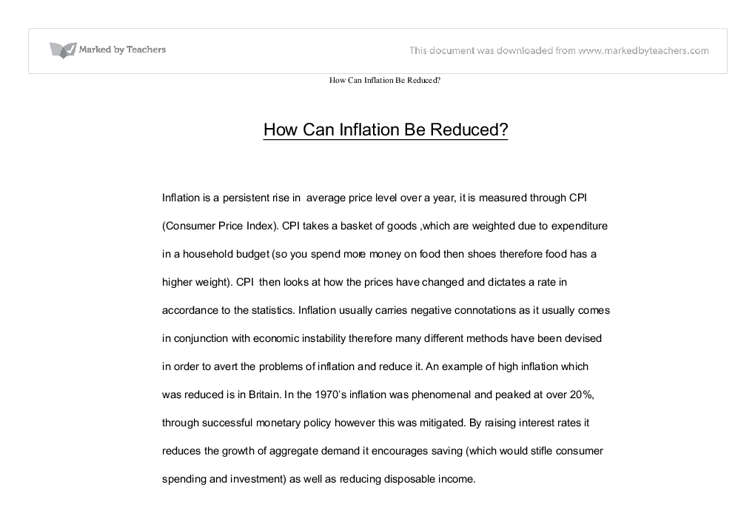 Inflation can be reduced through numerous ways, the most commonly used would be monetary policy, this is because its easy to modify as well as very effective. All the methods however are flawed, personally I would strongly advise not using "price controls", governments do not possess sufficient knowledge on social aspects to dictate prices. Although in extreme situations price controls have to be used (like in a war) other then this they should be avoided as they are too dismissive of social implications. I agree more with the classical ideals as less government intervention does allow more businesses to prosper, it is much wiser to allow competition then to hinder it for inconsequential reasons. Although measures have to be put on businesses these should be a minimal as possible to allow free growth in a free market. A Keynesian would argue that state intervention and state stimulation is paramount to the mitigation of inflation and the growth of the economy. However state intervention has been practised in Britain through the labour government and was embarrassingly flawed. As long as governments protect the consumer while allowing growth of free enterprise inflation can be controlled, its when companies can't compete and consumers halt purchases that an economy have problems. Although monetary is grossly overused it is probably the most effective method of overcoming inflation along with a moderate government who don't adopt too interventionist policies. Although the outstanding panacea for inflationary worries is simply knowing what causing inflation, its no use for governments to adopt monetary policy when fiscal is needed. Transparency of the problem is the real cure for inflation. ?? ?? ?? ?? How Can Inflation Be Reduced? By Thomas Hannah ...read more. This essay responds superbly to the task. There is a clear engagement with fiscal and monetary policies being used to reduce inflation, and there is awareness of the limitations of both. There is clear understanding of what inflation is, and how the policies reduce it. However, I would've liked to have seen some diagrammatical analysis to secure this understanding, as this is the easiest way to pick up marks in an exam. The question does not ask for an evaluative response, however there is a clear justified judgement here. This is good, as it shows the ability to look for weaknesses in policies, and discuss the effectiveness. I do think this essay is overly long though, despite the breadth covered. The analysis in this essay is great. The definition of inflation is clear and precise, allowing for a focused argument throughout. What I particularly like about this essay is the explanation of the mechanisms. For example, "To reduce inflation through monetary policy you must increase interest rates" is not simply asserted. But, each step from an increase to interest rates, to the eventual decrease in inflation is explained well. This is where a diagram would've simply strengthened the analysis, as shifts in aggregate demand and supply could show the changes in the price level. The awareness of different schools of economic thought shows a very abled economist at A-Level. Examiners love to see that students don't simply accept what the textbook states, and this essay explores how classical and Keynesian views differ. There is some very perceptive and strong analysis here! The structure is strong. There is a clear introduction defining the key terms, and a strong conclusion which weaves the argument together whilst posing justified judgements. I would note that putting the first person in a conclusion is unwise. For example saying "I agree more" suggests a personal view, and often these aren't backed up with analysis and strong arguments. By using phrases such as "the analysis clearly shows that" you won't be tempted to make assertions based on personal arguments. Technical terms are used fluently, and economic viewpoints are weaved into the argument well, rather than being forced. This style is sophisticated, and makes for a convincing argument. Spelling, punctuation and grammar are flawless. The Bank of England normally operates the scheme. All persons wanting foreign exchange make an application to the bank. The Bank of England then grants or refuses their request. In refusing requests for foreign currency they are effectively reducing the money supply of the pound on to the market, therefore raising the price of the pound or economy. Small companies are to be helped in attracting investment by incentives which should follow successful schemes established in America. It was also announced that the government wants 'Britain to be the best location for science and Research and Development2' in the world. who are willing and able to work at going wage rates are able to find work. Another interpretation is when the total of people out of work matches the number of unfilled job vacancies. The problem with this is that estimates of the scale of job vacancies vary considerable. In this graph, the price and quantity equilibrium which is at the intersection of the demand and supply curves can only be gained in a closed economy without trade. When we incorporate free trade into the model, the price of the good in the world market is Pworld. ECONOMICS PAST PAPER QUESTIONS WITH ANSWERS - price elasticity and inflation. Thirdly, the price system enables the economic problem to be solved in a way which combines efficiency. Efficiency, because the profit motive promotes enterprise; because movements in the relative prices of the factors of production stimulate entrepreneurs to economize in the use of scare factors. An increase in interest rates will affect both the capital account and the current account of the balance of payments in a way that will reduce the excess supply of money on foreign exchange markets. High interest rates reduce the demand for imports and more importantly lead to capital inflow.